What is one of the biggest differences between a content marketer who is effective and one who flails? A documented content marketing strategy. 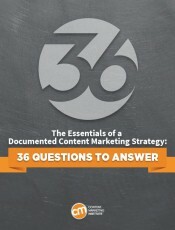 To find out how to create a documented content strategy, including the 36 questions to ask, download our 16-page guide, The Essentials of a Content Marketing Strategy. While what you need to document will differ based on your content marketing maturity and the requirements of your organization, this guide will walk you through the process. Not to mention you will also be joining over 90,000 of your peers by subscribing to CMI’s daily articles and news emails. Download The Essentials of a Documented Content Marketing Strategy guide now and be on your way to being more effective!